This was the question I found myself asking of We Fight 4 Science, an interactive theatre quest devised by Theatre OI with support from Finger in the Pie, recent producers of the acclaimed Waiting for Stanley. But where Stanley was a love-telegram to the world of ‘Keep Calm’, WF4S is a glitch in the Matrix, a kooky science lesson out to set Schrödinger’s cat amongst the proverbial pigeons. Entering the Dugdale Centre, Enfield, each participant is issued a party bag and wheelie chair by a lab-coated actor, and propelled into the centre of a black box space, surrounded by cardboard oddments. The show kicks off video game style with a storm of chiptune music. Three figures hit the stage, alongside big-screen personal avatars (à la RPG character selection screen). The assembled trio unleashes a combo of kung fu & platform-running in high, 8-bit style. 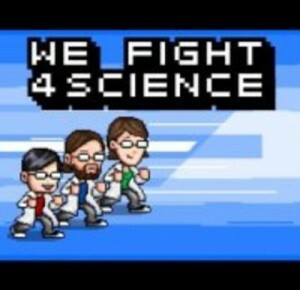 This is vigilante unit ‘We Fight 4 Science’. The heroes turn out to be less Zelda more BBC computer: the enthusiastic, quaint and beguilingly ineffectual scientists Rufus (Alfie Boyd), Caroline (Claudia Jefferies) and Scott (Tuan Ly). Donning the white coats of bona-fide scientists they welcome us to the launch of ‘Non-Government Approved Acclimatization Center for Time Travellers’ and promise a warp-speed experience of quantum mechanics, featuring genuine time travelers. WF4S pause to explain their scientific, albeit cardboard, apparatus; Scott proudly operating a gravity detector (dropping a football) and proclaiming the results… gravity is working. What follows is Lectus Interuptus. The proceedings break down in eruptions of ego (Rufus impotently hijacks Caroline’s big moment, in the guise of intergalactic-villain ‘Zargon 7’) and even due to a collapse of reality, providing a hiatus satirically exploited as an advertising slot. The subsequent commercial for ‘The Telephone of Tomorrow’ is a witty gag. The science of the show is also tactile and smart, kind of Blue Peter does the Royal Society Lectures; with an explanation of the multiverse via balloon modeling and an enlightened unwrapping of neutrinos using puppetry and light. The participants are kept swiveling as things unravel. Some are spirited off to ride down a homemade time-tunnel. Undercurrents of chaos carry us to the grand climax. And it’s unsurprising that we don’t find one. Despite the party bags and a blitz of technology & tickertape, no time traveler materializes through the specially constructed portal. WF4S retreat into cyberspace, mission seemingly unaccomplished… only to return as RPG avatars once more; scientifically-speaking zeros, but virtually-speaking heroes. This Scott-Pilgrimesque VR/Reality overlap is tantalizing and so begs more exploration and definition. But perhaps thinking ‘causally’ about a work so clearly riding the wormholes is a shortcoming on my part. The rapport between performers and participants, opens up a neat exploration of disappointment and is a hurrah for amateurism in an serious age of experts. WF4S is a playful homage to pop-science and our collective inability to grasp the quantum bits. At least that’s what Sheldon would think.